What is "normal"? Can it be defined...or is it all a matter of perspective? Ginny, a twenty-something who uses the sensual nature of food as a focal-point in her daily struggle to understand herself (and her Asperger's), grief, those around her, and just being normal, is the main character of The Kitchen Daughter , a novel by Jael McHenry. But what Ginny doesn't expect when retreating to the safety of her familiar kitchen are the spirits that are invoked when she cooks a handwritten recipe, as written. I am a believer in the supernatural...and I am a believer in the the power of food memory...so these moments in the book were what fascinated me the most. I wish they would have lasted longer, actually. The story of the struggles between sisters and lovers and family also played their role at keeping me wondering what was going to happen next. Sometimes it is the things that our loved ones work so hard at sheltering us from that actually wind up bringing relief and a sense of who we are once they are out in the open. While she "collected" normal her whole life (read it...you'll understand), it took the death of her parents for Ginny to actually believe that she was just as normal as the checker at the market, the girl with red hair down the street, or the doctor in the next room. From tears in my eyes to cheeks that ached from grinning to a belly that grumbled at me from the fabulous descriptions of food and recipes on these pages, there were many different aspects of this book that I enjoyed. I actually find myself wanting a sequel so that I can experience the next stage in Ginny's journey. 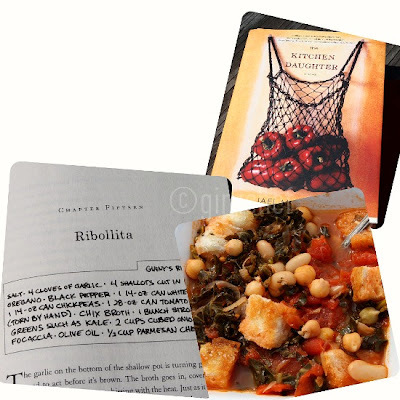 From the first ghost-summoning recipe for her Nonna's Ribollita all the way to Ginny's own version in the end...I knew that this was what I would wind up making first from this book. And I am so glad that I did. 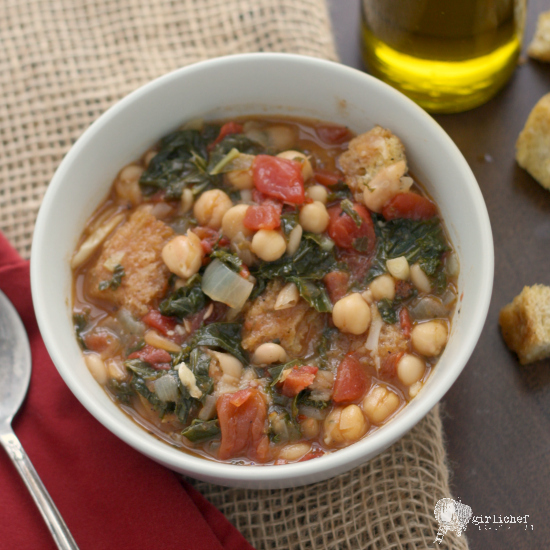 When making Ribollita, traditionally you would use stale Tuscan Bread (Pane Toscano), which infamously turns rock hard as it gets old. You could substitute any heart bread here, if you don't have it. Try to find Tuscan kale (also known as Dinosaur or Lacinto kale) if possible, but curly will work (as witnessed in the photos), if you can't get your hands on any. 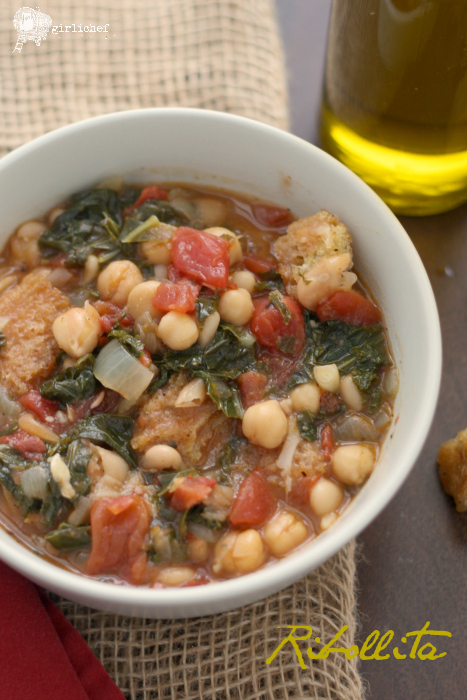 Ribollita is a hearty Tuscan soup made with beans, kale, vegetables, and leftover bread. The translation of the name, literally means reboiled. Drizzle the bread cubes with olive oil, sprinkle with salt and pepper, then toss to distribute well. Spread in a single layer on a baking sheet. Bake for 20-25 minutes, until golden and crunchy. In the meantime, heat olive oil in a medium-sized pot set over medium heat. Once hot, add onions and garlic and cook until they begin to soften, ~5 minutes. Add oregano and chile flakes and stir for 1 minute. Add drained beans (both), the tomatoes with their juices, and the broth; bring to a boil. Reduce heat allow to simmer gently for 10 minutes. During this time, remove the thick stems from the kale and then roughly chop the leaves and thinner ribs. Add to the pot and simmer for another 10 minutes. Taste and adjust seasoning with salt, pepper, and chile flakes as needed. At this point, if you want, drizzle with a tablespoon or two of Balsamic vinegar (or save and pass it at the table). 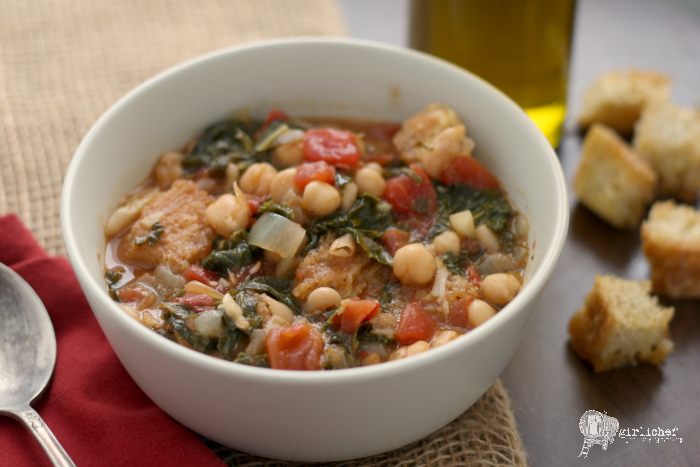 Divide the crusty bread cubes between four to six bowls, then ladle the soup into the bowl over the top and serve. If you're not using all of the soup, be sure to reserve some of the bread cubes. Cooled soup can be stored in a lidded container in the fridge for 2 to 3 days. To reheat, bring back to a simmer and serve over bread cubes. You will probably need to add more broth (or water) if you are reheating, as the beans will have soaked a lot of it up.